It's a New Year and you know what that means, it's time for a new Calendar and we've found just the one for all you dog lovers out there. You can score this FREE downloadable Pit Bull Calendar for the month of JANUARY by simply signing up to receive a Newsletter from Blush & Honey Paper. Every month you will receive a new FREE Monthly Calendar featuring a pup that is up for rescue. This month's calendar features a Pit Bull mix named Chico that us up for adoption at the Young Williams Animal Shelter located in Knoxville, Tennessee. The February Calendar will be sent out on January 20th 2017 and will feature a new special dog that is up for rescue. Lauren Hitchcock is an illustrator and art teacher residing in Knoxville, Tennessee with her husband and their two dogs who have played an integral part in her artwork. Lauren paints beautiful illustrations of pets and donates a portion of the proceeds to an animal rescue to help other animals in need. Lauren's artwork can be described as a delicate and happy mix as she incorporates soft colors and beautiful florals in her work. It is truly pleasing to the eye and you can tell that love has been put into each and every piece. 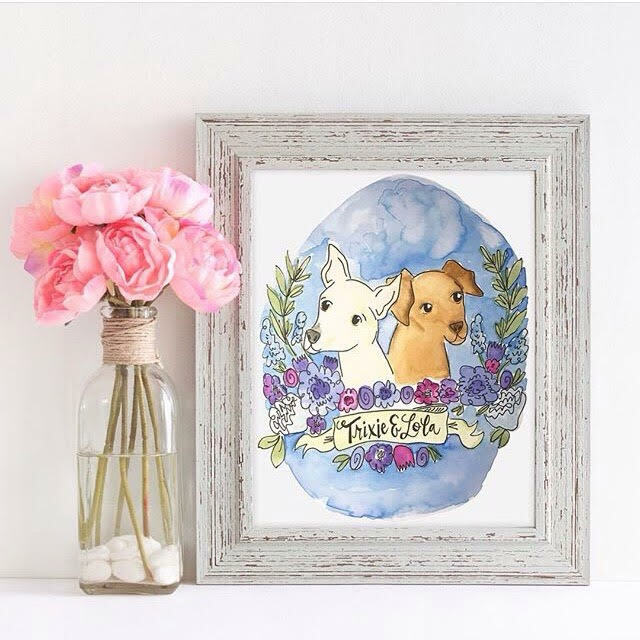 Lauren creates custom paintings and mugs that any pet owner would be delighted to have of their loving pet. Lauren says: "When I'm not creating paintings, I have other passions and hobbies. Somewhat unsurprisingly, most of them have to do with animals and art! I'm an art teacher at a local elementary school, and this past year, I wrote my first children's book entitled "D is for Dog: Pups from A to Z." My husband and I love traveling, and recently had the opportunity to visit Amsterdam and Paris. A special highlight of that trip was seeing Monet's waterlily garden. As a watercolor artist, that was simply unforgettable! I can't wait to get to know you and your family, and I hope you enjoy looking at my work as much as I loved creating it!" You can view more of her work here in her Portfolio. You can follow Blush & Honey Paper Co. on Instagram to see more of the beautiful illustrations created by the wonderful artist Lauren Hitchcock.